$60.316 million on 4258 screens. 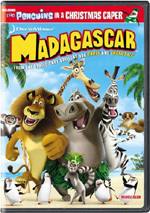 Will the Madagascar series ever come to an end? Not as long as the films continue to make money, I suspect. With a US gross of $216 million, 2012’s Madagascar 3: Europe’s Most Wanted took in more money than either of its predecessors, 2005’s Madagascar and 2008’s Madagascar: Escape 2 Africa. That made sense to me, as I felt Wanted provided the best of the franchise to date. Originally, four animals from a New York zoo – Alex the lion (voiced by Ben Stiller), Marty the zebra (Chris Rock), Melman the giraffe (David Schwimmer) and Gloria the hippo (Jada Pinkett-Smith) - got accidentally shipped off to Madagascar. Since then, they’ve tried to return home. We last saw them in Africa, which is where we find them now, but they didn’t abandon their attempts to get back to the Big Apple. The penguins plan a quick gambling trip to Monte Carlo and promise to come back to get the zoo animals and fly them back to NYC in their cobbled-together plane. However, they renege on this deal, so Alex and company need to find them and get back to the blueprint. This sends the zoo animals to Monaco, where they encounter a threat from obsessive animal control Captain Chantel DuBois (Frances McDormand). Stranded after they run from her, they come upon European circus animals and join their group, though this occurs against the wishes of head tiger Vitaly (Bryan Cranston). The zoo critters need to figure out how to blend with this new group, avoid DuBois and plot their way home. So one went down as “basic entertainment” and the other was “serviceable entertainment”, and both lacked the potential to stick in my memory. Such sentiments didn’t exactly set my heart aflutter with high expectations for Wanted. In fact, I saw the third flick theatrically out of basic boredom. My job gives me a lot of time off over the summer, so I went to Wanted because I didn’t have much else to do. Darn if I didn’t find myself awfully entertained by the third film. What changed from the first two? I don’t know – I find it hard to explain what specifically improved from the prior movies. I just think there’s a creative looseness of display in Wanted that was absent from its predecessors. With the others, I felt they tried too hard and suffered from forced cleverness. I’d encounter gags that seemed like they should amuse but they didn’t; the jokes lacked a certain spark to make them leap off the screen. With Wanted, however, we encounter a certain roguish charm. The first two movies almost seemed like they were made by committee; it felt like all involved were so worried about making money and finding an audience that their creativity got set to the side. Here I get the sense that the success of the prior movies allows the filmmakers to go wild. All bets are off; they’ve already proven themselves so now they can go for whatever goofy gags they desire. The first real sign of this comes in Monte Carlo when Captain DuBois chases the animals. This sequence packs more nuttiness and wit into its short running time than the prior two movies combined across their three hours. It’s a real showstopper, and it’s just the start, as the rest of the movie continues along the same wacky, wild path. Granted, Wanted doesn’t excel in all ways. It sags a bit when we met the circus animals, and some of the inevitable lesson-teaching narrative elements can be sappy. The new castmembers are mostly forgettable; McDormand is fun, but others like Cranston, Jessica Chastain and Martin Short don’t add much to the experience. Nonetheless, Europe’s Most Wanted comes packed with so much inspired comedic lunacy that I can forgive any of its minor flaws. This is a film in which a lemur steals a ring from the Pope and uses it to propose to a circus bear – how could I not be impressed? Madagascar 3: Europe’s Most Wanted appears in an aspect ratio of approximately 1.85:1 on this Blu-Ray Disc. I expect excellence from animated films on Blu-ray, and Wanted matched those hopes. At all times, sharpness looked amazing. Not even the slightest hint of softness ever marred the image, as it consistently remained tight and concise. I saw no signs of shimmering or jagged edges, and edge haloes/noise reduction were absent. Of course, print flaws failed to materialize; this was an image free from flaws. With its variety of settings – Monte Carlo, the circus, etc. - Wanted came with a vivid palette. The different colors consistently looked dynamic and exciting, with lively reproduction of the tones. Blacks seemed tight and deep, and shadows looked smooth and clear. This was a terrific presentation. Though it started slowly, the film’s Dolby TrueHD 7.1 soundtrack eventually became fairly involving. Early on, the mix seemed a bit antiseptic, as the elements didn’t blend together as well as I’d like. However, it soon pepped up and became more engaging. With all its action and circus sequences, we got plenty of chances for the soundscape to come to life, and after that slow start, it succeeded. Planes and other components zipped around the room, explosions filled it and additional pieces popped up in logical places. These meshed pretty nicely and gave us a good sense of the action. Audio quality was also fairly positive, though I thought it could’ve boasted more heft at times. In terms of effects, they showed solid clarity and often displayed nice punch, but on occasion, I felt bass should’ve been more impressive. Speech was distinctive and natural, while music showed nice range. The minor flaws kept this one from “A”-level, but the soundtrack still added pep to the movie. The Blu-ray comes with a pretty good set of supplements. We open with an audio commentary from directors Eric Darnell, Tom McGrath and Conrad Vernon. All three sit together for this running, screen-specific look at story/character areas, animation and visual design, working with 3D, music and effects, research, cast and performances, and a few other topics. I looked back at my reviews for the first two movies and found that I thought those film’s commentaries were pretty dull. That surprised me, for Darnell, McGrath and Vernon work hard to make this one a peppy affair. They joke around a fair amount, but they also cover a good variety of subjects. This means we have a good time while we learn about the flick. Next comes a Trivia Track. This delivers exactly what one might expect, as we get a mix of production facts, notes about cast and crew, and links to other films. We also learn about some “freeze frame” moments via text that mentions tidbits we might easily miss. The factoids pop up a bit less frequently than I’d like, but they’re still fun and informative. Another running feature arrives via The Animator’s Corner, a picture-in-picture piece. It involves Darnell, McGrath, Vernon, head of character animation Rex Grignon, head of story Rob Koo, producers Mark Swift and Mireille Soria, head of effects Scott Peterson, head of layout Nol Le Meyer, visual effects supervisor Mahesh Ramasubramanian, supervising animators/character lead animators Bryce McGovern and Carlos Fernandez Puertolas, production designer Kendal Cronkhite-Shaindlin, and head of lighting Laura Grieve. Along with their comments, we see concept/character art, animatics and storyboards, and a few other behind the scenes elements. “Animator’s Corner” touches on the same subjects found in the commentary – partly because it occasionally literally repeats the commentary. Parts of “Corner” show us the directors as they chat about the flick; too many parts, for my liking. If “Corner” included the entire commentary, it’d be fine, or if it included none of the commentary, it’d work well. But as it stands, fans must sit through both the audio commentary and “Corner” to get all the provided information, so they’re stuck with quite a few redundant elements. Despite that repetition, “Corner” proves to be worthwhile. It gives us a good variety of insights, with an emphasis on technical areas. The glimpses of art and behind the scenes tidbits add value to the package as well. I wish I didn’t have to hear parts of the commentary a second time, but the “Corner” still merits your attention. Aimed at kids, Get Them to the Train offers a game. In this, you must match various animals with their train cars and then aim a cannon to shoot them into those locations. I’ve played worse games, but this one still isn’t a ton of fun. A featurette called Big Top Cast goes for 13 minutes, 38 seconds and offers notes from McGrath, Darnell, Vernon, Swift, Soria, and actors Ben Stiller, Chris Rock, David Schwimmer, Jada Pinkett Smith, Bryan Cranston, Jessica Chastain, and Martin Short. The program looks at actors, characters and performances. Much of this follows an “everyone was great!” path, but I enjoy the shots of the actors at work, so this becomes a decent piece. Three Deleted Scenes occupy a total of six minutes, 18 seconds. We find “Melman Picks a Circus Act” (3:29), “Next Performance: New York City” (1:14) and “Lion Meet Venom” (1:35). These mix crude story sketches and rough computer animation; they also come with introductions from the filmmakers. All three clips are fun but not essential. It’s still good to see them here, though, especially since the last two concentrate on the amusing DuBois character. Mad Music Mash-Up fills one minute and gives us a music video of sorts. It mostly takes clips from the movie and matches them with a mix of “I Like to Move It” and “Afro Circus”. It’s fairly forgettable. Another featurette, Ringmasters lasts 15 minutes, 27 seconds and follows a day in the life of the production. We locate material from Darnell, McGrath, and Vernon along the way, as they become our tour guides. This piece delivers a cool look at the production and turns into a nice extra. Finally, the Madagascar 3 Roundtable runs three minutes, 48 seconds and throws in notes from the four lead actors: Stiller, Rock, Pinkett-Smith and Schwimmer. They sit together and discuss their experiences across the three Madagascar movies. It’s too brief but it’s still enjoyable. The disc opens with ads for Rise of the Guardians, Dragons: Riders of Berk, How to Train Your Dragon Live Spectacular, and the Kung Fu Panda Holiday Special. 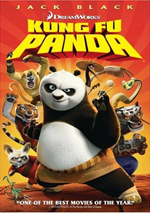 Under Previews, we find promos for Guardians, JumpStart Into Madagascar World, How to Train Your Dragon, Kung Fu Panda and the Madagascar 3 video game. No trailer for Madagascar 3 appears here. If you click Sneak Peek, you’ll see a 20-minute, 23-second look at the aforementioned Dragon Live Spectacular. It includes comments from Dreamworks CEO Jeffrey Katzenberg, director Nigel Jamieson, movie writer/director Dean DeBlois, creature designers Sonny Tilders and Philip Millar, digital designer Domenic Di Giorgio, production designer Peter England, head of puppetry Gavin Sainsbury, costume and projection designer Dan Potra, international technical director Malcolm White, film producer Bonnie Arnold, and actors Riley Miner, Gemma Nguyen, Sarah McCreanor, and Rarmian Newton. The program tells us about the Dragon stage show and aspects of its creation. While we find a smattering of interesting behind the scenes tidbits, the featurette exists to sell tickets, so don’t expect much from it. On a second disc, we get a DVD Copy of the film. This delivers a retail version, so it comes with plenty of bonus materials. 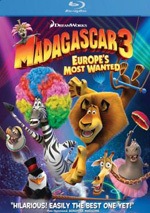 After two fairly mediocre movies, I didn’t expect much from Madagascar 3: Europe’s Most Wanted. However, it works much better than its predecessors, as its sense of comedic anarchy makes it a blast. The Blu-ray delivers excellent visuals as well as positive audio and a pretty solid roster of bonus materials. Chalk up Madagascar 3 as a pleasant surprise and a terrific Blu-ray.